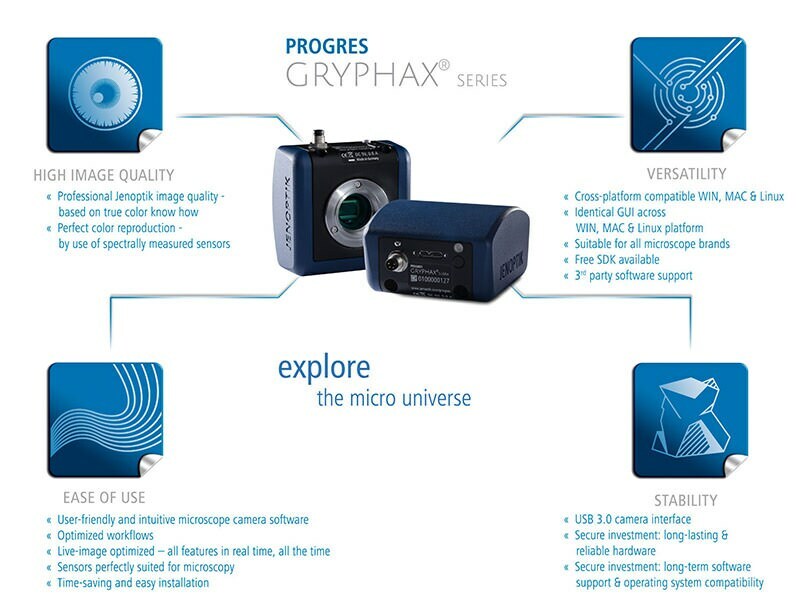 Jenoptik PROGRES GRYPHAX® series offers state of the art USB 3.0 microscope cameras including intuitive microscope camera software. JENOPTIK GRYPHAX-series enables you to refine your microscope to a state of the art digital workstation. Save time! JENOPTIK GRYPHAX® microscope camera software is part of each camera delivery. You install this particularly user-friendly software intuitively without any prior knowledge on your WIN, MAC or Linux operating system. All cameras offer live images in video speed and thus facilitate your daily work. Save 20% off the recommended retail price. Do you have a digital microscope workstation? Your camera performance doesn't fit to your daily challenges anymore? Your ProgRes® camera has a successor. Change it for a PROGRES GRYPHAX® camera and become the next GRYPHAX® community member. Experience the high image quality, versatility, ease of use and stability of Jenoptik's latest USB 3.0 microscope cameras. Jenoptik equips the JENOPTIK GRYPHAX® series microscope cameras with the latest CMOS technology. Short exposure times and high image refresh rates make the system time-saving and convenient to use. This means you can position and focus fast and easily, even on moving objects. JENOPTIK GRYPHAX® products are easy to use with any microscope — whatever the brand, thanks to the C-mount interface. No matter if you work on WIN, MAC or Linux operating systems the software offers you always an identical user interface. Free updates for the JENOPTIK GRYPHAX® software allow you flexibility and mean you are always kept up-to-date. You want to increase the flexibility and application range of your microscope camera? Ask for our DijSDK to embed our JENOPTIK GRYPHAX® camera portfolio within the shortest time. The JENOPTIK GRYPHAX® series SUBRA camera brings reliability and efficiency to microscopy image acquisition. Its modern CMOS sensor featuring a particularly high pixel resolution delivers shorter exposure times and high image refresh rates. You can work very comfortably with the microscope camera, as well as save time. The microscope camera offers excellent image quality thanks to its exceptionally high degree of sensitivity and quantum efficiency. It provides accurate color reproduction with the finest gradations and generates a fast live image in full HD. This makes it even easier for you to position and focus the preparation being examined, bringing it quickly into focus. Even moving objects can be examined with ease. The camera features a modern, fast USB 3.0 interface. You will also receive the appropriate software and free updateswith the camera, so you can upgrade your microscope to a modern digital workstation. High image quality: Full HD & 2.2 MPix, Pixel size 5.5 x 5.5 µm, 12 Bit, Color camera. Versatility: Exposure up to 2 seconds and Gain up to 8. Ease of use: Free JENOPTIK GRYPHAX® microscope camera software, large field of view 2/3“, 30 fps @ Full HD (2 MPix), Global shutter and no external power supply needed. Stability: CMOSIS sensor, Made in Germany, 24 month warranty and software updates free of charge. The JENOPTIK GRYPHAX® ARKTUR USB 3.0 microscope camera from Jenoptik enables you to „Research Life”, to “Examine Elements”, to “Evaluate quality” and to “Reveal Truth”. Explore your personal micro universe. High image quality: In Full HD, 3,8 & 8.2 MPix, Pixel size 2.4 x 2.4 µm, 10 Bit, Dynamic range 66 dB, Color camera. Versatility: Exposure up to 10 seconds and Gain up to 10. Ease of use: Free JENOPTIK GRYPHAX® microscope camera software, large field of view 2/3“, 50 fps @ Full HD, 30 fps @ 4K (8 MPix) and no external power supply needed. Stability: SONY Sensor – back illuminated, Made in Germany, 24 month warranty and software updates free of charge. The JENOPTIK GRYPHAX® NAOS USB 3.0 microscope camera from Jenoptik enables you to „Research Life”, to “Examine Elements”, to “Evaluate quality” and to “Reveal Truth”. High image quality: 2.1, 4.8 & 19.4 MPix, Pixel size 2.4 x 2.4 µm, 12 Bit, Dynamic range 71.8 dB, Color camera. Ease of use: Free JENOPTIK GRYPHAX® microscope camera software, large field of view 1“, 50 fps @ 2.1 MPix, 30 fps @ 4.8 MPix and no external power supply needed. The JENOPTIK GRYPHAX® KAPELLA is a sensitive color camera for challenging samples and lighting conditions. It offers scientific users a new level of image dynamics and richness of detail. The microscope camera from Jenoptik enables you to „Research Life”, to “Examine Elements”, to “Evaluate quality” and to “Reveal Truth”. The operating software is included and can be installed quickly and is operated in the same way on different computer operating systems such as Macintosh, Windows and Linux OS. High image quality: With WUXGA, Pixel size 5.86 x 5.86 µm, 12 Bit, Dynamic range 73.3 dB, Color camera. Versatility: Exposure up to 60 seconds and Gain up to 30. Ease of use: Free JENOPTIK GRYPHAX® microscope camera software, large field of view 1/1.2“, 60 fps @ 2.3 MPix and no external power supply needed. The JENOPTIK GRYPHAX® RIGEL is the monochrome counterpart to the KAPELLA and is the most sensitive camera in the entire portfolio. The operating software included is tailored precisely to the requirements and workflows of the user. High image quality: With WUXGA, Pixel size 5.86 x 5.86 µm, 12 Bit, Dynamic range 73.3 dB, Monochrome camera. Versatility: Exposure up to 120 seconds and Gain up to 60. Jenoptik completes portfolio of microscope cameras with the JENOPTIK GRYPHAX® PROKYON. The JENOPTIK GRYPHAX® PROKYON camera, the flagship of the JENOPTIK GRYPHAX® range, combines the best properties of all the models. It is the perfect all-round camera, capable of dealing with all aspects of microscopy through its image resolution of between 2.3 and 20.7megapixels. Jenoptik is thereby continuing to invest in microscanning and color co-site sampling technologies. True colors can now be determined at speeds never previously achieved. High image quality: With WUXGA 9.2 and 20.7 MPix, Pixel size 5.86 x 5.86 µm, 12 Bit, Dynamic range 73.3 dB, True color camera. The JENOPTIK GRYPHAX® Software package is included in the scope of delivery. Registered users may download the current version as well as more recent updates without charge. Optimize your image results in just a few clicks! High image quality: Professional Jenoptik image quality - based on true color know how and perfect color reproduction – by use of spectrally measured sensors. Versatility: Cross-platform compatible with WIN, MAC & Linux, identical GUI across WIN, MAC & Linux platforms, suitable for all microscope brands, free SDK available and 3rd party software support. Ease of use: User-friendly and intuitive microscope camera software, optimized workflows, Live-image optimized – all features in real time, all the time, sensors perfectly suited for microscopy and time-saving and easy installation. Stability: USB 3.0 camera interface, secure investment: long-lasting & reliable hardware, long-term software support & operating system compatibility. OPTRONICS® - Karl Storz Imaging, Inc.
Micro Optic Nosch Günter Wasmer e. K.
Radical Scientific Equipment Pvt Ltd. I. Miller Precision Optical Instruments, Inc.
Tecnica En Laboratorios, S. A.